Replace your stock cylinder heads with high flowing S&S Super Stock heads. 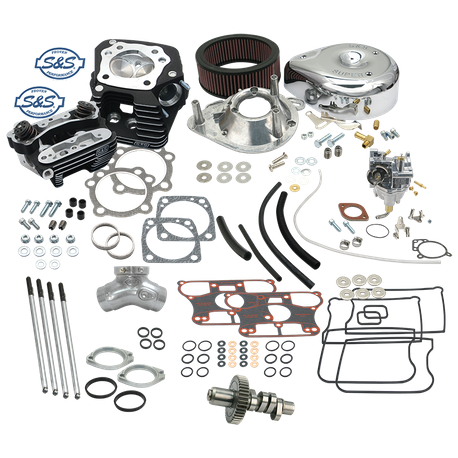 This kit contains everything you need to to replace your heads and optimize the performance of your engine with the S&S 561 camshaft, chromoly steel adjustable pushrods, and a Super E carburetor kit, complete with manifold and a high flow S&S teardrop air cleaner. The design of the Super Stock combustion chamber requires a special domed piston to yield the optimum 10.2:1 compression ratio and to optimize combustion chamber turbulence for superior flame travel. Pistons must be ordered separately.